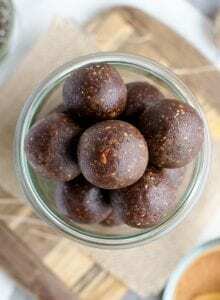 What’s so great about these chocolate superfood energy balls, besides the delicious taste and texture? Well they’re packed with a bunch of awesome plant-power superfoods! We’re talking flax, walnuts, cacao, hemp protein, hemp seeds, chia seeds, ground flax and pure cinnamon. 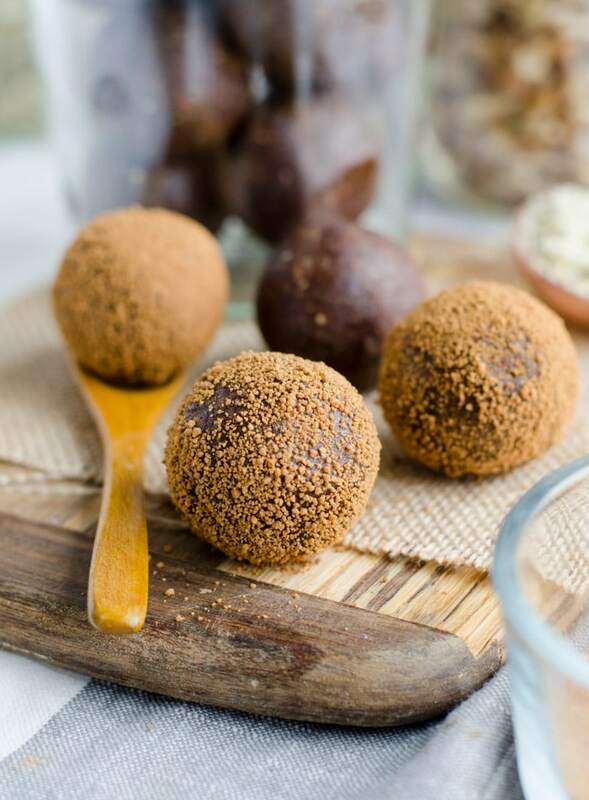 These chocolate bliss balls contain protein, fibre and omega 3 and 6 fatty acids plus packed with vitamins and antioxidants. What puts the superfood in superfood energy balls? This chocolate combo include hemp seeds, chia seeds, ground flax seeds, ceylon cinnamon, raw walnuts, cacao powder and hemp protein powder. These ingredients offer a range of vitamins, minerals, antioxidants and healthy omega-3 fatty acids. All the good stuff! I used ceylon cinnamon (also called true or real cinnamon) in this recipe but if you don’t have any you can use regular cassia cinnamon. Ceylon cinnamon contains more nutrition and has a slightly sweeter, more delicate flavour and is lighter in colour than regular cinnamon. Most cinnamon you find in stores in cassia cinnamon, it’s much more common and less expensive than real cinnamon but you should be able to find real ceylon cinnamon at any well-stocked grocery store, natural food store or online. Both work fine in this recipe you just won’t get the same nutritional benefits if you use regular cinnamon. I use regular cinnamon all the time, I just decided to use the good stuff for these balls! I like using ceylon cinnamon with dates for it’s ability to regular blood sugar. I also like that it’s high in antioxidants and has anti-inflammatory and anti-bacterial properties. It’s more expensive than regular cinnamon though, so I don’t always use it. You can use either or, I just wanted you to be aware there is a difference. Just like cinnamon, there is a big different between regular processed cocoa powder and cacao powder. I use cacao powder in recipes like this because I like it’s nutritional benefits. Cacao is contains iron and magnesium and is loaded with antioxidants. It’s one of my favourite superfoods. That being said processed cocoa powder and cacao interchangeable, so use which ever one you prefer. I use cacao powder most of the time but it is more expensive than cocoa so sometimes I just use regular cocoa powder. Allllright. 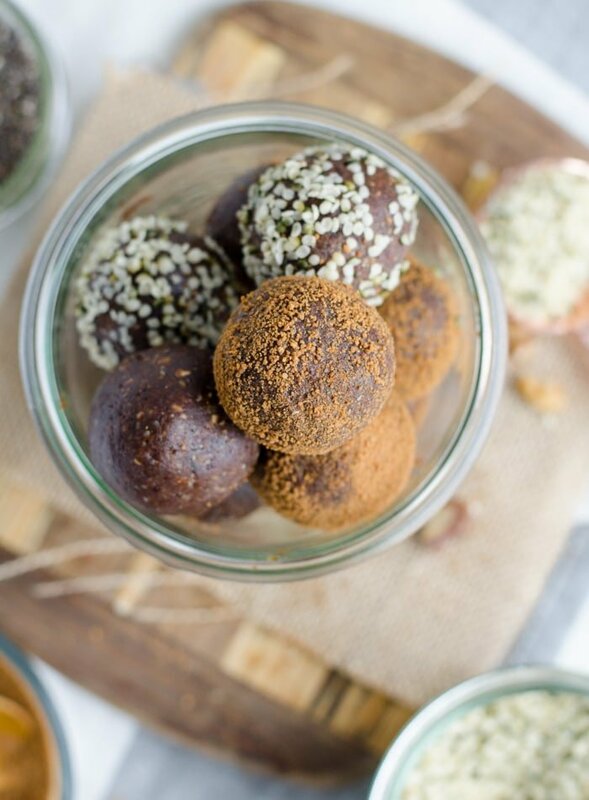 About these no-bake chocolate balls. Pulse the walnuts, add the rest of the goods, blend it all up, roll it into balls, let it sit in the freezer for a bit, roll in stuff if you feel like it, then eat them. You’ll need about 5 minutes to make them and about 1 second to devour them. Worth it. Every time. Thanks to the natural sugars, protein and healthy fats these are awesome for before or after a workout. They’re also yummy enough for a healthy dessert or just a sweet treat anytime you feel like and are looking for a natural boost in energy. Try not to eat them all right way and you’ll have a stash of healthy snacks to eat all week! 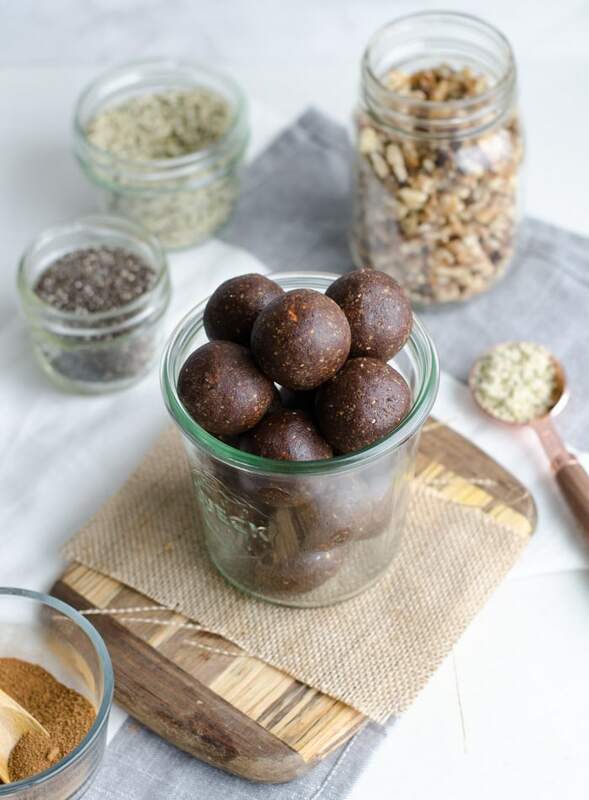 If you like the looks of these, try my Pecan Pie Energy Bites, Low-Fat Cinnamon Energy Balls, Carrot Cake Energy Balls, Lime Coconut Energy Bites and Raw Vegan Cashew Coconut Balls. YUUUUM. 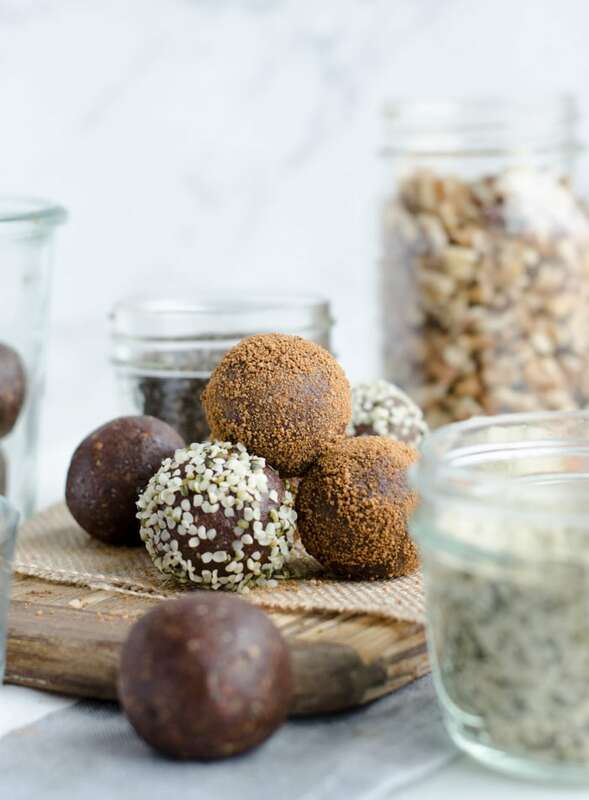 These Chocolate Superfood Energy Balls are loaded up with all the good stuff such as chia, hemp and flax seeds so you can snack smart and know you’re giving your body plenty of nutrition. Bonus: they also taste amazing. Blend the walnuts for a minute or so until they’re broken down. Add the rest of the ingredients and blend until a dough forms. Roll into approximately 16 balls and let them set in the freezer for a couple hours. These can be store in the fridge for at least a week or in the freezer for up to 3 months. I rolled mine in a mixture of coconut sugar and cinnamon for an extra treat, totally optional. You could also roll them in hemp seeds, chia seeds, coconut or cacao powder. I do not like walnuts, and have an almond allergy…any recommendations on nuts that taste good with this recipe? I am in need of some new on the go snacks to take with me between meetings/appointments during the day, so I can stay steady, and not be forced to grab something not so good for me because I have gone too long without eating. 🙂 Thanks! I think cashews and hazelnuts would work well! I almost always have some kind of snack like these on hand for busy days for that exact reason! These look great! I will be trying them soon and sharing on my blog. Can the energy balls be stored in glass cookie jar on shelf, if so for how long. I would recommend storing them in the fridge or freezer to keep them fresh. I’m not too sure how long they would last at room temperature, maybe up to 4 days in a cool, dry place? They can be kept in an air-tight container in the fridge for up to 2 weeks, or in the freezer for up to 3 months. 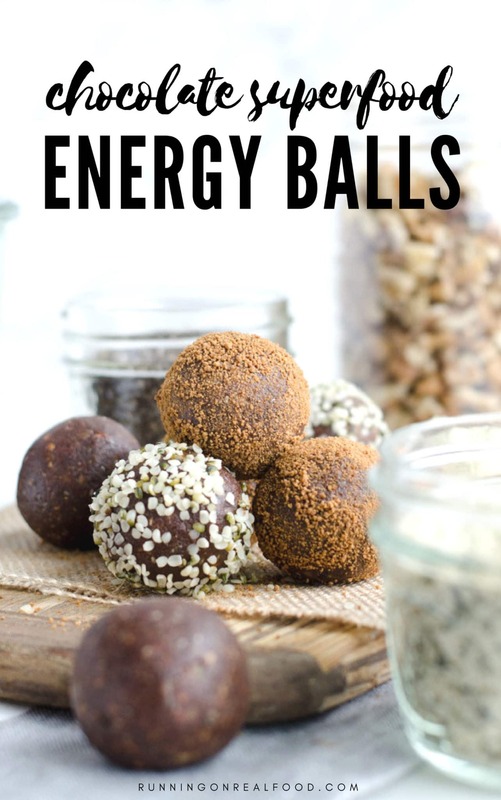 Energy balls, YES PLEASE. Love them and love preparing them at home. Thanks for the recipe! You’re welcome, Kelly! Hope you enjoy them. These look great! I’m a nursing mum & lately have been trying to find ways to get more oats & flax in to my diet to support lactation. I’m gonna whip these up with a tsp of brewers yeast & keep them on around for afternoon snacking. It also helps me to remain fit and healthy. These are perfect for afternoon snacking!! They’re the perfect sweet treat but still full of nutrition. I really love these balls. My kids love them too. Well I’m very glad to hear that! Glad you enjoy them! Can I use oat flour in place of the hemp protein powder? I have everything but that ingredient and really wanna make these! Hi Cora, you can leave it out and increase the cocoa powder to 3 tbsp and ground flax to 2 tbsp. Enjoy!